Eagerly anticipated ever since Sony floated its wood-block concept designs at the PMA show in February, Sony's Alpha NEX-5 and NEX-3 have finally arrived. Its debut models are the smallest entrants to date, and are aggressively priced given their features. Overall, the photo quality is really good, and the camera has a very nice noise profile and dynamic range for its price class. But there are caveats. For one, it has the same unfortunate issues with Sony's Creative Styles that all the company's dSLRs do: the default renders inaccurate colors, which isn't helped by the overly cool automatic white balance, and there's no natural Creative Style option. Not even in the bundled raw software. Also, though the 18-55 kit lens is pretty sharp, it has some of the worst distortion I've seen on a non-point-and-shoot camera of late. That includes barrel distortion at the 18mm end and pincushion at the 55mm end. As a result, not only are lines curved, but there's some fringing around the edges of the scene. Video is sharp and the lenses are really quiet, both for zooming and focusing, but you have practically no controls beyond a background defocus scroll. For instance, it wouldn't let me spot meter a backlit subject; instead, I had to crank the exposure compensation all the way up, guessing based on a hard-to-gauge display. While it has built-in stereo mics that are reasonably separated physically, the audio sounds a bit tinny. And the camera really needs a wind filter. The camera feels fairly fast, though the autofocus system tends to be inconsistent. Most of the time it's quite decisive, but occasionally hunts for no reason that I can figure out. Like most cameras without an optical viewfinder, for burst shooting you're stuck with point-and-pray. It also feels like it takes forever to start up. That's borne out by our testing, which puts it at about 1.7 seconds—slower than all but Olympus' models. At 0.4 second, it has the least shot lag of its class in good light, though Panasonic bests its 0.8-second time to focus and shoot in dim light by about 0.2 second. We clocked its burst rate with autofocus at 2.6 frames per second; we don't test the rate without AF, which Sony specs at 7fps. The new all-aluminum Sony E-mount lenses dominate the the NEX-5's body, and they feel great, with a smooth rotation for both zoom and manual focus. The 18-55 feels a bit large for the compact body, and I suspect the 18-200mm lens ($799.99, expected this Fall) will really overwhelm it. You should also keep in mind that unlike the Alpha DSLRs, which have image stabilization built into the camera, the NEX models use optical stabilization in order to achieve the smaller body sizes. Sony will be offering an adapter for using non E-mount Sony lenses with the NEX models, but as with most competitors the adapters don't support autofocus. And those huge, heavy Sony lenses really will overwhelm these tiny bodies. The camera itself is pretty well designed and easy to grip and shoot. It doesn't have a built-in flash, but does ship with a small add-on flash that uses a proprietary connector. Sony will also have an add-on microphone. Sony makes the same mistake as Olympus did with the E-P1 and forgoes an electronic viewfinder; though the company doesn't say it supports one, I'm hoping that accessory connector can be retrofitted for it. There is a direct-view optical viewfinder designed to work with the 16mm prime lens, but that's not a sufficient substitute. And while the large LCD is certainly nice and high resolution, with a brighter backlight than that on the A550 dSLR, I still had some issues viewing it in bright sunlight. The interface has a few fixed buttons, such as drive mode and exposure compensation, while the rest are contextual, depending upon camera mode. Overall, this scheme works pretty well, but there are some irritating quirks to the menu system. For instance, you can't scroll backwards to get from the first entry in a menu to the last. And because the contextual interface requires you use the menus, you're in there all the time if you want to change shooting settings such as metering or ISO sensitivity. Also, while I generally like the scroll wheel's operation, when using it for the virtual mode dial I kept flying past my target. 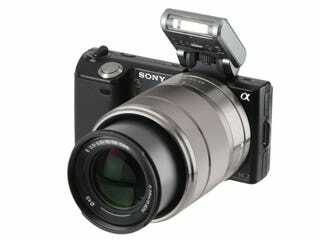 The NEX-5 carries over a lot of the features from Sony's point and shoots. Though it doesn't use the Exmor-R back-illuminated sensor, the new 14-megapixel sensor is fast enough to support features like sweep panorama, which dynamically stitches together a burst of shots into a 23mp panorama; handheld twilight mode, which automatically combines 6 shots to optimize the dynamic range in low light; and a 3-shot AutoHDR mode. The Handheld Twilight does very well with low-light images. It's not practical in every situation, though, because it still has to process the buffered images, which take a while to save. And while the sweep panorama still suffers from some unavoidable artifacts, such as Picasso-like pieces of people walking through the scene, it does capture enough detail that it doesn't look so bad when you zoom in. In July, Sony will be releasing a firmware update that can process the sweep panorama shots into stereoscopic 3D images for playback on a supporting TV. More than any other interchangeable-lens camera I've seen, the Sony NEX-5 seems optimized for the point-and-shoot upgrader; not necessarily because it's easier to use than any other or that it's priced particularly low, but because it's full of constraints that will probably bother enthusiasts a lot more than snapshooters. That's a pity, because the video quality, noise profile and performance are really appealing. Still, Sony has hit a lot of the right notes for that more mainstream crowd, a lot more than anyone else, with its compact size and a user interface that's got a relatively high discoverability quotient, albeit not terribly efficient to actually use. If it had an EVF option, an artifact-free basic zoom lens, better color options and white balance, and a well-thought-out menu system, it would probably be the no-brainer choice we've been waiting for. As it stands, it's just a strong contender.